My guinea pig died and it didn't live a good life for what he meant to me.. Breed my own pedigree guinea pigs and show them, hopefully winning some rosettes! I have long admired the work of Hartly Holder and her mother rescuing abused and neglected guinea pigs and re-homing them from their home rescue. 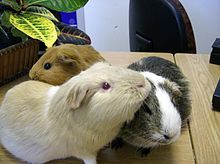 I would love to visit them and see all their guinea pigs.